Frequently asked questions and What if? Part 1: Is there something wrong with my camera? Part 2: My camera is OK. Is there something wrong with my technique? Part 3: My camera needs adjusting. Can I do it myself? Part 4: Frequently asked questions and What if? What is Hyper focal distance? What do I need to know about wide angle lenses? What does 100% crop mean? How is the best way to use AE-L/AF-L button? The D70 Manual is very confusing about AE-L/AF-L button. Translation, Please. How do I prevent droopy eyes in flash pictures? How Do I focus or meter on something that is not in the center of the picture? How do I Trap Focus? Depth of field (DOF) is a term which refers to the areas of the photograph both in front and behind the main focus point which remain "sharp" (in focus). Depth of field is affected by the aperture, subject distance, focal length, and film or sensor format. A larger aperture (smaller f-number, e.g. f/2) has a shallow depth of field. Anything behind or in front of the main focus point will appear blurred. A smaller aperture (larger f-number, e.g. f/11) has a greater depth of field. Objects within a certain range behind or in front of the main focus point will appear sharp. The front and back range of the depth of field are not symmetrical. the area behind the focal point is more than twice the distance as before the focal point. This is only a rough approximation. A great deal has to do with the focal length of the lens, the angle and distance of the camera above the ground. The ratio could be almost 5 to 1 in the worst case of using a wide lens on a table top. Wide angle lenses have greater depth of field than long telephoto lenses. To compute the depth of field and hyper focal distance, use the following calculator at this link. 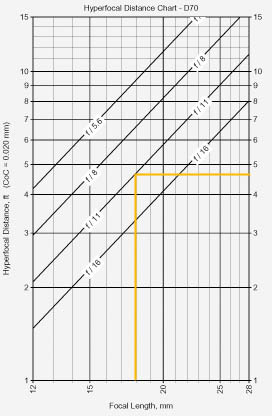 The circle of confusion dimension is .020 mm for a 1.5 crop factor DSLR such as a Nikon D70 or D100. Hyper focal distance is the distance you must focus a lens to achieve acceptable focus from infinity (the horizon) to the forward most acceptable distance which is usually quoted along with the hyper focal distance. It is the practical application of depth of field associated with landscape photography. Wide angle lenses at small apertures have the greatest range of acceptable focus. If you know the hyper focal distance the range of the forward focal depth is one half that distance. The chart on the right shows that the Kit lens at 18 mm has a hyper focal distance of 4 feet, 9 inches at f11. When focused at that distance, everything from 2 feet, 4.5 inches to infinity will be in focus. That means if you kneel down and include flowers and grass within reaching distance your entire picture will be in focus. It is even more impressive to think of what you can do with a 12 mm lens. A 12 mm lens is capable of a sharp image from one foot to infinity at f11, the sweetest spot on the lens. On a normal clear day the shutter speed will be more than adequate for hand holding. The forward focal point is easily computed as half of the hyper focal distance. Because of the depth of field and favorable hyper focal distance of a wide lens, you should never use auto focus unless you use focus lock on a closer object than the horizon. As you learned from the previous two FAQs, most of the usable focus range is behind the focus point and there is nothing behind infinity. Many wide angle lenses will have some marking on the focus barrel indicating f5.6, f8 and/or f11 on each side of the focus scribe marks. These marks can be used as a reminder to set the hyper focal distance in the field. By aligning the correct mark with infinity you are assured the greatest range of sharpness. You may be greatly disappointed when viewing a 100% crop of a wide angle lens because of the fuzziness of familiar objects which will be much, much smaller in the picture. Reserve your judgment until you can see a print at the size you will use the picture. The method for determining acceptable focus is computed on a technical assumption about the size of the print and the smallest object resolvable. This term is called “Circles of Confusion”. Since this is a simplified explanation, I will not attempt to explain those terms which can be found on the web using Google. You can prevent a lot of distortion in buildings and interior rooms by leveling the camera and cropping appropriately. Some very wide angle lenses are “fish-eye” and will curve straight lines. They can be linearized with software editors. Those lenses that are already linearized by design will still distort rectangular shapes if taken at an angle. If you are hand holding inside a room and you want the room to look normal be aware of the vertical lines at either side of the viewfinder and tip the camera up and down until the lines are parallel with the edge of the frame. There will be instances when shooting exterior buildings when you are standing at the base and cannot get all the building included except by tilting the camera upwards. These can be corrected by transform functions within some photo editors such as Photoshop. You should not try to completely remove all geometric distortions because some perspective distortion is expected when it is obvious you are standing at the foot of a tall building. You can however improve perspective to give the suggestion that you were standing much further back to take the picture. It is a term used to describe a screen image whose pixel dimensions are the same as the camera dimensions (1:1) On a 19 inch diagonal screen at 1024x768 presentation, it would be like viewing a 40 inch wide print. It is the most critical way to view a digital image. Some people complain that their picture does not look sharp straight out of the camera judged by seeing a 100% crop. Seeing the picture printed at 10x15 inches would be a better method for judging the quality of the image. Your judgment of a 100% crop must be tempered by your understanding of the size of the whole image in relationship to what you see on the screen. The AE-L/AF-L button can be used for many purposes. Consider these situations. Prefocus automatically before manual focus. Focus on an object that is not centered in the viewfinder. Meter on an object that is not centered in the viewfinder. Save the pre flash value to take pictures of people who blink a lot. Trigger a camera automatically to photograph an animal at a feeder or a runner at the finish line. This button has evolved over many years and has existed before the Digital SLR. The history starts with the introduction of the two stage shutter release button which was introduced to save battery power when the solar cell was replaced by a more sensitive battery operated photo cell. A half press of the button energized the light meter and also computed the exposure for the aperture adjustment and/or the shutter mechanism. Then came auto-focus cameras and the half press had more functions. As metering became more complex by the introduction of multiple photocells and multiple auto-focus sensors camera engineers devised the AE-L/AF-L button to allow more creative flexibility for the photographer. AE-L = Auto Exposure Lock and AF-L = Auto Focus Lock. Now, there are multiple exposure options and multiple focus options combined with the two stage shutter button. This is complicated by the fact that the camera may be moved for artistic reasons after exposure or focus takes place. The binary possibilities grow from 4 to 8 to 16 …. Fortunately a menu system began to evolve for defining how the camera should operate and what button does what. Now comes a new twist. The Digital SLR must issue a pre-flash to measure the absorption of the scene for automatic flash adjustment (iTTL metering). For simple flash configurations it is only one fast pulse and then the mirror can come up and the shutter can open. But for commander mode which is used for operating remote flashes units in “Through the Lens metering” there may be 4 or more pre-flashes to communicate back and forth between the camera and remote flashes. Some people actually blink fast enough that this is a major drawback for this lighting system. Wouldn’t it be nice if you could pre-flash the scene and automatically set the exposure for all subsequent flashes thereby eliminating the half closed eyes of the rapid blinkers? Well, you can, just change one menu pick to create that condition. Here is where you have to understand that the AE-L/AF-L button cannot be used for Flash Lock and regular exposure and focus lock at the same time. You have to choose between these features. See the next few questions to learn how to use your AE-L/AF-L button. Before looking at the table consider these terms. Lock means that the exposure value or the focus condition has been satisfied and should not change unless there is a condition mentioned. Hold means that the button does not need to be kept depressed and that a subsequent press of the button will release the hold/lock. In other words, it toggles on and off. When exposure is locked you will see “EL” in the lower left of the view finder. The E meter turns on with power on or the shutter is half depressed or the AE-L/AF-L button has been pressed. The meter will turn off when the timer for auto turnoff has clocked down. If you plan on using a hold or toggle option you should set the meter for a longer time. The meter uses more power than the camera at rest. When power is off, the battery will last almost a month. With the camera in standby with the display panel active (power on) the battery will last about 18 days. Meter, monitor display and flash use considerably more power than the standby condition. The battery charge will last a year outside of the camera. Single Servo AF Focus locks when in focus indicator appears in viewfinder, photographs can only be taken when camera is in focus. AF-S is displayed in control panel. This is default for every mode but Sports. Very important to know that this mode will not allow the shutter to fire unless green in focus indicator is showing in viewfinder. The half press shutter function can be transferred to the AE-L/AF-L button. Continuous Servo AF Camera focuses continuously while shutter release button is pressed halfway. Photographs can be taken even when the camera is not in focus. AF-C is displayed in control panel. This is the only mode permitted in Sports mode. Very important to know that this mode will allow the shutter to fire even when green indicator is not showing in the viewfinder. (Not true using the D50) The half press shutter function can be transferred to the AE-L/AF-L button. 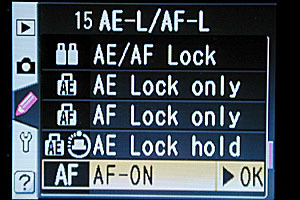 (default) Both focus and exposure lock while the AE-L/AF-L button is pressed. You must keep it depressed while operating the shutter button. No value is saved when the button is released. The EL indicator will be on when active. The exposure meter will not time out if you continue to hold this button. AE Lock Only Exposure locks while the AE-L/AF-L button is pressed. Focus is unaffected. Same as above, except focus works normally on half shutter button. AF Lock Only Focus locks while the AE-L/AF-L button is pressed. Exposure is unaffected Half press and release shutter button to focus. Then press and hold the AE-L/AF-L button to hold focus. Half press the shutter button again to get new exposure value and focus will stay as it was until the shutter is released. The EL indicator will be on when active. AE Lock Hold Exposure locks while the AE-L/AF-L button is pressed and remains locked until button is depressed again or exposure meter turns off. Press and release the AE-L/AF-L button. Exposure will be computed and held until the button is depressed again or until the meter time runs out. Multiple shots may be made on the same meter reading but eventually the timer runs out. You should set a long timer for this mode. Your long choices are 16 seconds and 30 minutes. The EL indicator will be on when active. AF On Camera focuses when AE-L/AF-L button is pressed. Camera does not focus when shutter release button is pressed halfway. The camera focuses when the AE-L/AF-L button is depressed. In the AF-S focus mode the camera will focus when shutter is half pressed. If the camera is moved so as to be out of focus and the shutter is pressed all the way, nothing will happen until some object comes into the focus path. Then the shutter will fire. This is known as a trap shutter and can be used to photograph an animal at a feeder or a runner at the finish line. Flash level locks when the AE-L/AF-L button is pressed and remains locked until button is pressed again or exposure meter turns off. Camera should be in any mode that permits flash (not scenic mode). Menu Item #19 FLASH MODE should be TTL or Commander mode. Press the AE-L/AF-L button. The flash will fire but the shutter does not fire. “EL” appears in the lower left of the viewfinder indicating the flash value has been sent to the remote SBx00 or the onboard TTL flash system. Press the shutter button. There will be only one flash fired after the mirror is up. Continue to use the flash as long as the “EL” indicator is showing. Flash level locks when the AE-L/AF-L button is pressed and remains locked until button is pressed again or exposure meter times out. Exposure can only be locked by pressing the AE-L/AF-L button. Exposure will be computed by the half press of the shutter button unless the the AE-L/AF-L button is being pressed or is holding a previously locked value. Exposure can be locked by pressing AE-L/AF-L button or by pressing shutter-release button. +Release should be interpreted as "or" release. CAUTION - If CS #15 is set to the defalult setting of AE-L/AE-F Lock and the AE-L/AF-L button is depressed the camera will not focus with the half shutter release. The correct focus has to be achieved before the AE-L/AF-L button is pressed. This is not the case when the AE Lock Hold is set. The focus will take place at the half press. Droopy or blinked eyes are sometimes caused by the pre-flash that takes place when using TTL metering. It can be eliminated by executing the pre-flash in advance of the actual capture of the image. The following is for a Nikon D70 however other cameras may be adjusted the same way using a different menu item number. Camera should be in any mode that permits flash (not scenic mode). Menu Item #19 FLASH MODE should be TTL or Commander mode. Ready the flash unit by mounting the SBx00 or popping up the onboard flash and/or selecting the flash symbol. Frame the picture in the viewfinder and depress the AE-L/AF-L button. The flash will fire but the shutter will not move. The symbol “EL” will appear on the bottom left side of the viewfinder indicating that the pre-flash has been executed and the exposure value is locked for the next shot. Shoot as many pictures as you need with this setting until the situations changes and you need to compute a new value. To return to normal mode, press the AE-L/AF-L button again and the “EL” indicator will turn off. At this point the pre-flashes will occur when the shutter is depressed. Repeat the previous step for a new scene. By using this method you can prevent many blinkie pictures. You cannot, however completely eliminate blinks and so you should take as many additional pictures as you need to make sure everybody in the picture has their eyes open. In a very bad situation you could clone open eyes from one picture to another to have a complete group of open eyes. Here is where we have to understand that the AE-L/AF-L button cannot be used for Flash Lock and regular exposure and focus lock at the same time. You have to choose between these features. In part two of this series we discussed the two different focus modes which were AF-S (Single Servo) and AF-C (Continuous Servo) Which is Custom Setting #2 on the D70. This method relies on the AF-S mode starting the focus at the beginning of the shutter button movement with the object of interest already framed by the center focus brackets. When focus is achieved, then the camera is moved to re-frame the shot with the focus locked by holding the shutter button at the half point. The AF-S (single servo) mode has already satisfied the requirement for focus. The green focus indicator in the viewfinder stays on even though the sensor no longer sees a focused image at the center, thus allowing the shutter to be fired. See Part 2 of this series for a pictoral explanation. The alternate way to do this is to use CS #15 AF ON and CS #2 AF-C. This allows you to focus with the AE-L/AF-L button until you decide you want to stop changing the focus and let up on the AE-L/AF-L button. The focus remains locked (stays the same) until you press the shutter release button. Exposure will depend on what the camera sees when the shutter releases. Use the same CS #15 AF ON as above but change the CS #2 to AF-S. Use the AE-L/AF-L button to set the focus point on an animal feeder or finish line at a race. It is best to use a tripod since moving the camera around can trip the trap. Move the camera off the focus area and press the shutter release all the way down. Nothing happens. When an animal or any moving object comes into the focus sensor range and registers as being in focus the shutter will trip. This will work because of the rule that AF-S mode will not allow the shutter to release until focus is achieved. The AF-C mode continues to try to adjust the focus up to the time the shutter fires and will in fact fire even if focus is not detected. (This is not true with the D50, focus must be detected). This last fact is something that will come into play as we move the focus control to the AE-L/AF-L button. Thanks to Tim Jackson, Phil Askey, Peter Inova and Thom Hogan for educating me with their fine publications. Please visit their sites listed above and help support their work.